1259546942 –Bateman/Snell/Konopaske Management: Leading and Collaborating in a Competitive World remains on the cutting edge of topical coverage and draws from a wide variety of subject matter, sources, and personal experience with a special emphasis on themes throughout the product such as real results, ethics, cultural considerations, and leadership and collaboration. The mission of the product is to inform, instruct and inspire. 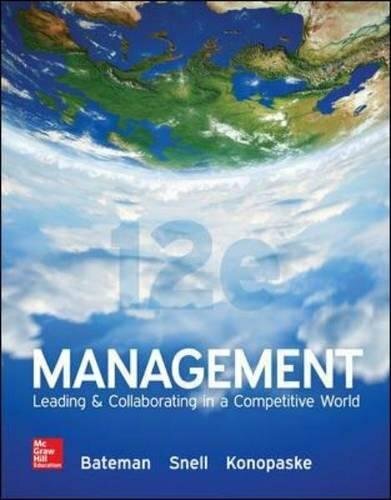 It informs by providing descriptions of the important concepts and practices of modern management. It instructs by describing how you can take action on the ideas discussed. And it inspires not only by writing in an interesting and optimistic way, but also by providing a real sense of the opportunities ahead of you. Bateman/Snell/Konopaske’s results-oriented and student-friendly approach are unique hallmarks of this textbook. In this ever more competitive environment there are six essential types of performance, on which the organization beats, equals, or loses to the competition which are cost, quality, speed, innovation, service and sustainability. These six performance dimensions, when done well, deliver value to the customer and competitive advantage to you and your organization. Bateman/Snell/Konopaske remind students of these six dimensions and their impact on the “bottom line” with marginal icons contributing to the leadership and collaboration theme, which is the key to successful management. People working with one another, rather than against, is essential to competitive advantage.